One pot Creole jambalaya is a recipe that will bring back memories of being in the French Quarter of New Orleans. It’s full of shrimp, sausage, chicken, tomatoes, and rice. Jambalaya is perfect for a party or a family dinner, since it’s so easy and everyone loves it. Are you craving some comfort food from Louisiana? Try making our one pot creole jambalaya for supper. It’s easy to do, and everyone will love it! What is the difference between Creole and Cajun jambalaya? The main difference is the color. Creole, or red, jambalaya has tomatoes in it, so it will be red or orange in color. Historically, tomatoes were easier to get in New Orleans because it was a port city. Cajun, or brown, jambalaya doesn’t include tomatoes, because it was harder for the Cajun people who lived in southern rural Louisiana bayous to have access to them year round. Another difference is the order in which the ingredients are cooked. Creole jambalaya recipes cook the meat and trinity together, while Cajun jambalaya recipes spend time browning the meats before the trinity is cooked. The last difference is the flavor profile. Cajun jambalaya has a more umami-rich flavor due to the browning of the meats, while Creole jambalaya is more acidic, due to the tomatoes. What is the history of jambalaya? It is traditionally believed that the Spanish settlers invented this dish. They adapted their beloved paella, which required saffron, to the ingredients they could get in Louisiana. It features three vegetables: onions, celery, and green bell pepper. The French settlers adapted it from the French mirepoix, which is onion, celery, and carrot. The trinity ratios are traditionally 50% onions, 25% celery, and 25% green bell pepper. The next time you are craving a food from southern Louisiana, make this jambalaya recipe to serve your family and friends. It will quickly become a family favorite. Bring back memories of being in the French Quarter in New Orleans with these other delicious recipes. Creole Red Beans and Rice: an easy, nutritious dish cooked low and slow for a fabulous flavor. Crusty Homemade Baguettes: five ingredients, a gentle hand, and patience is all it takes. 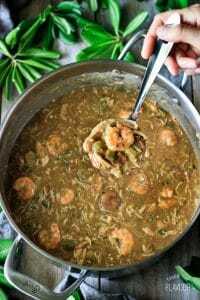 Chicken, Sausage, and Shrimp Gumbo: this delicious soup is so full of flavor, you’ll want a second bowl! Did you make this recipe? It would make our day if you shared how it turned out in a review. In a heavy-bottomed Dutch oven, heat 2 tablespoons of olive oil over medium high heat. Add the cubed chicken breast. Stir frequently as it browns for 5 minutes. Remove the chicken and place in a medium bowl. In the same Dutch oven, heat one tablespoon of olive oil over medium high heat. Add the sausage. Stir frequently as it browns for 5 minutes. Remove the sausage and place in a medium bowl. You will see a fond, or flavorful brown crust, on the bottom of the Dutch oven from browning the meat. Use the water from the vegetables (the holy trinity of onion, celery, bell pepper) to deglaze the pan (lift off the fond). Over medium high heat, cook the holy trinity until the onions are soft and are a light golden color, stirring occasionally. Add the minced garlic and stir until fragrant. Stir in the rice until well mixed, then stir frequently for another 3 to 5 minutes or until it’s toasted. Add all the spices and stir well. Add the crushed tomatoes, chicken stock, chicken, and sausage. Stir until well combined. Cover and bring to a boil; then turn down the heat to medium-low and let the rice cook for 20 minutes. Don’t remove the lid as the rice cooks, or it will slow down the cooking. Stir in the shrimp, then cover and cook for 3 minutes. Adjust seasonings to taste by adding a sprinkle of salt and pepper. Remove the pot from the heat. Let it rest on the stove top for 20 minutes so the rice can absorb the liquid. Sprinkle the jambalaya with chopped green onion for added color. Serve warm with a salad and a French baguette. This Creole jambalaya recipe is on the low end of the medium spicy range. If you want it mild, reduce the cayenne pepper to 1/4 teaspoon. If you would like it spicier, you can increase the cayenne pepper to 1 teaspoon, add hot sauce, or add 1 or 2 chopped jalapeno peppers with the seeds. If you can’t find andouille sausage, use a smoked pork sausage or Mexican chorizo. If you are allergic to shrimp, use crabmeat or crawfish instead. No chicken? Substitute ham, tasso, or pulled pork. Just wanted to ask when do you add the chicken and sausage back in ? Do you add it in with the broths? Any help with this would be appreciated i really want to try this recipe. Thank you. Yep, you’re correct. Return the browned meats with the broth. Thanks for pointing that out. It’s been added to the recipe instructions. Let me know how it goes.